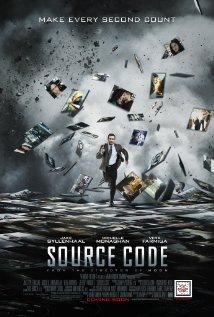 Source Code, starring Jake Gyllenhaal and Michelle Monaghan, is “an action thriller centered on a soldier who wakes up in the body of an unknown man and discovers he’s part of a mission to find the bomber of a Chicago commuter train.” I cannot describe the movie much more without ruining the plot so I will leave the overview at that. I disagree to an extent about the movie being classified as an action thriller. There are certainly action and thriller elements to the movie, however, the movie is primarily dialogue driven with action sequences kept to a minimum. This might be bad news for those looking for nothing but action. I’ll start by saying that the movie was extremely good. It might even have made it into my Top 5. The storyline was original – and so was the “gimmick”. In my books, uniqueness is weighted heavily and certainly helped boost my rating. The dialogue was also one of the best parts of the movie, although I have seen a lot better (think The Taking of Pelham 123). There was a distinct humanistic element of the movie – seemed a little tacked on near the end but did help to develop the characters and add charm to the movie. Usually these elements are added to appease the critics – whom seem to be won over almost entirely by the amount of human emotion in a movie. Unlike some movies that overdo the love story, this movie kept a delicate balance between nauseating emotion and emotionally devoid. I saw the movie in AVX (better sound, bigger picture) but it wasn’t necessary. The movie is story and dialogue heavy with little action and special effects to make use of AVX. Although, in general, I do recommend AVX as it is a great experience – just choose the movie wisely. I will say that for this movie, you will enjoy it just the same in a regular theatre (or even at home for that matter). Overall, the movie was fantastic and definitely worth the watch. There was essentially a two-part ending – with the second part being completely unnecessary. In fact, I think the movie is a lot better if you ignore the last 5 minutes and just pretend it ended at the “first ending”. For those who have seen the movie, you probably know what I mean. 5 out of 5. The first part of the two-part ending that I described above is the happy scene when everyone is on the train happy and laughing and the lead actors kiss. It would have made a fantastic ending to finish off the movie with them kissing and then have time stop. Or, alternatively, for Jake to realize that time had not stopped and he had beat the system. Unfortunately they decided to continue the movie past that part and add in a twist that was completely unnecessary and I believe really hurt the ending of the movie. He should have died happily after having accomplished his goal. Reliving the memories of another individual through a computer program is a neat concept. For a while I was confused by the fact that he was able to act outside those memories. I later determined that anything that happened outside those memories were an extrapolation performed by the Source Code “software” – the calculus that was referred to, although I cannot be sure. Why were the memories changing each time he went in? Perhaps more extrapolations made by the software depending on slight variations in his behaviour? That is one thing left open in my mind. Otherwise the movie made a lot of sense (excluding the ending). Can anyone explain how it makes sense that he was then able to influence reality from within a computer program? I presume it was just an artistic twist they decided to add that I believe really took away from the movie. Ending was garbage in my opinion. Felt tacked on just to add another twist and something to think about. Not all movies have to leave you guessing – it would have been perfect to leave it as it was. What did you think of the movie? Any help interpreting it Is welcome.